For sensitive and specific toxin detection, mycotoxin immunoassays depend upon antibodies with high affinity and selectivity. While intact immunoglobulins remain the primary toxin-binding elements used in rapid assays, a number of alternatives have begun appearing in the literature. The alternatives can be broadly classified into those that are obtained by chemical synthesis and those that are obtained by altering biologically derived materials. Examples range from synthetically prepared polymers to recombinant fragments of antibodies, with a wide variety of synthetic and natural materials in-between. To date, obtaining the combination of selectivity and affinity needed for use in sensors has been more readily accomplished with biologically derived materials than with synthetic materials. Despite this, synthetic materials still offer certain potential advantages, such as high binding capacity and the ability to bind in environments that are too harsh for intact antibodies. 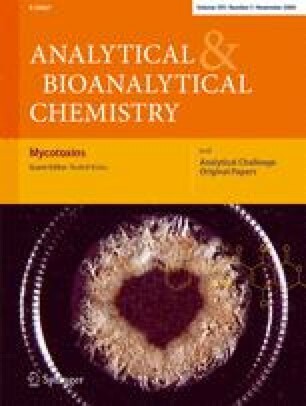 This review focuses upon recent advances in the development of mycotoxin-binding materials and their potential for application in mycotoxin assays. Mention of trade names or commercial products in this article is solely for the purpose of providing specific information and does not imply recommendation or endorsement by the US Department of Agriculture.